As SHL Group expands to provide customers with readily available services and production capabilities, the company insists on investing in high quality moulding machines such as those from KraussMaffei. SHL has been manufacturing with KraussMaffei high precision moulding machines for years to produce the company’s medical device products (such as auto injectors and pen injectors), and have purchased 10 more CX series machines following the company’s recent expansion. SHL believes that in the biopharmaceutical industry, there is no room for error as patient lives are at stake. Although SHL do not provide products and services directly to patients, the company works closely with the world’s top biopharmaceutical companies to provide combination products such as auto injectors and pen injectors, and thus quality and precision is still of the uttermost importance. When manufacturing the secondary packaging of these combination devices, all the components must be produced at the same quality level and possess verifiable compliance to the most stringent quality standards even when production is running 24/7. Therefore, it is paramount that SHL chooses the right machine partner, and KraussMaffei has proven over the years that they are the right quality choice. 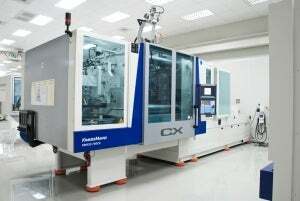 "With the CX series of machines, we have further enhanced reliability and continue to consistently produce high-quality components for the medical and healthcare industry worldwide. Our goal is zero error tolerance, a goal that our partners must share with us. KraussMaffei is a preferred while excellent partner for us", comments Roger Samuelsson, CEO and President of SHL Group. SHL continues to manufacture high quality medical devices for customers by providing a suite of integrated solutions which includes design, development, manufacturing capabilities and final assembly all in-house. By doing so, SHL can supervise each key development and manufacturing stages to ensure quality and compliance and involve and update the customers when appropriate. As the world’s biopharmaceutical companies’ demands for combination products like auto injectors and pen injectors continues to grow, SHL will also substantiate relationships with quality partners like KraussMaffei to provide the highest quality services and manufacturing capabilities to customers.